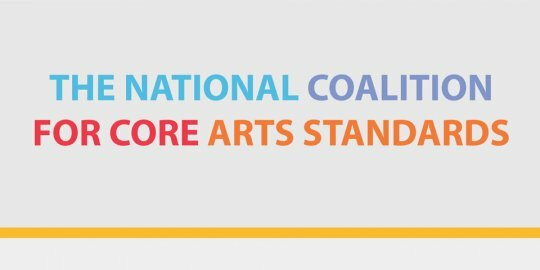 On Wednesday, June 4, 2014, the National Coalition for Core Arts Standards (NCCAS) launched the new National Core Art Standards website! The National Core Arts Standards are written by and for arts educators to support quality teaching and learning. The new National Core Arts Standards were revised to emphasize collaboration and communication – key components of the 21st Century skill set desired by employers and higher education. The new Core Arts Standards also promote the development of Artistic Literacy in all five art forms, by empowering students to independently carry out four shared Artistic Processes: Creating, Performing/Producing/Presenting, Responding, and Connecting. These processes are articulated in eleven Anchor Standards that are also common across art forms. They also include a new, fifth artistic discipline, media arts along with the original four: dance, music, theatre and visual arts. The addition of media arts standards reflects a broadened definition of arts-making that includes contemporary forms such as animation, film, gaming or interactive- and computer-based art-making. We fought to have this new discipline included since so much of residency programming is based in this discipline. The new national arts standards were written by a broad coalition of stakeholders that joined together to develop standards in the context of the most current research in the field, including national and international developments in education. 71 writing team members and teachers from early childhood through higher education participated in the writing of the new arts standards. Twice in 2013 and once in 2014, a public call was put out to the field to provide feedback on drafts of the standards. More than 6,000 people provided input during the public review process. Young Audiences Arts for Learning was proud to play a pivotal role in the writing of the standards and the creation of the new arts standards website. To celebrate the launch of the NCAS website, the organizing coalition hosted a streaming webcast conversation with arts educators, artists and arts advocates on Wednesday June 4, 1:00 to 3:00 p.m. To view the video archive of this free webinar, click here. For detailed information on how the standards were created, how they relate to the common core, and if your state will adopt them, please read the NCAS F.A.Q.